Bariatric surgeon James Parrish, MD talks about a new scientific study that favorably compares the safety and efficacy of gastric sleeve surgery to other weight loss procedures. 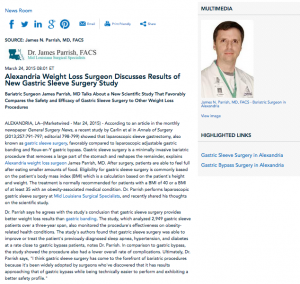 Alexandria, LA — According to an article in the monthly newspaper General Surgery News, a recent study by Carlin et al in Annals of Surgery (2013;257:791-797; editorial 798-799) showed that laparoscopic sleeve gastrectomy, also known as gastric sleeve surgery, favorably compared tolaparoscopic adjustable gastric banding and Roux-en-Y gastric bypass. Gastric sleeve surgery is a minimally invasive bariatric procedure that removes a large part of the stomach and reshapes the remainder, explains Alexandria weight loss surgeon James Parrish, MD. After surgery, patients are able to feel full after eating smaller amounts of food. Eligibility for gastric sleeve surgery is commonly based on the patient’s body mass index (BMI) which is a calculation based on the patient’s height and weight. The treatment is normally recommended for patients with a BMI of 40 or a BMI of at least 35 with an obesity-associated medical condition. Dr. Parrish performs laparoscopic gastric sleeve surgery at Mid Louisiana Surgical Specialists, and recently shared his thoughts on the scientific study. Dr. Parrish says continued advances in weight loss treatment options for patients fighting the effects of morbid obesity are extremely important. By discussing recent research findings, he hopes to increase awareness about the safety and efficacy of weight loss surgery so patients can make well-informed decisions. Dr. Parrish is past President of the Louisiana Chapter of the American Society for Metabolic and Bariatric Surgery. A board-certified General Surgeon, Dr. Parrish is a Fellow of the American College of Surgeons. He is also the Medical Director of Bariatric Surgery at Central Louisiana Surgical Hospital and Christus St. Francis Cabrini Hospital. Dr. Parrish is available for interview upon request.